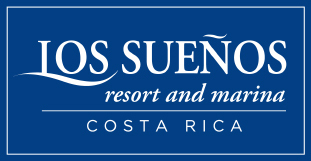 A Rooster fish originally tagged and released by the crew of Sunny One out of Los Sueños Resort and Marina was recently recaptured 330 Days later!! The Roosterfish (Nematistius pectoralis) named “Amy” (Tag ID: GFR1619) was originally tagged & released by angler John Bradley on February 19th, 2015 while fishing with Captain Ishmael and mate Christian Bolanos aboard the charter boat Sunny One, from our Official Research Center Los Sueños Resort and Marina, a five star resort and marina located in Herradura, Costa Rica (http://www.lossuenos.com). The Roosterfish was estimated to be 95 cm (38 in) total length and had an approximate weight of 40 pounds. The fish was recaptured on January 14th, 2016 by Captain Thomas Scott Jones and mate Fernando “Chena”Loria while fishing from the charter boat Mono Congo out of Bahia Rica Fishing & Kayak Lodge. Capt. 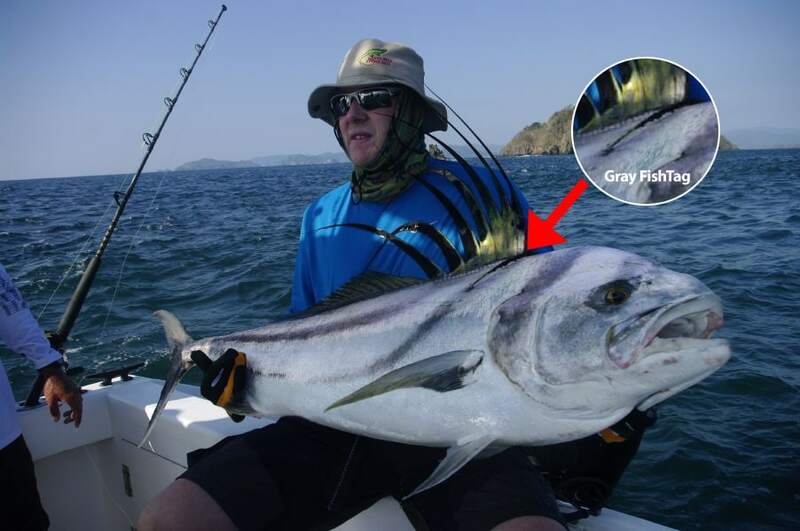 Jones, a lifelong fisherman who targets Roosterfish regularly, was surprised when the Roosterfish took down the bait of two live Lookdowns at the same time. He thought this fish must be big and special. Before releasing the fish, Capt. Jones noticed something small attached to the fish. Upon closer inspection he realized it was a scientific tag. Capt. Jones who has a strong interest in biology, was excited to see the tag and learn that his favorite fish was being studied by a research program. The Roosterfish was at liberty in the water for 330 days until its recapture in the water around the Negritos Islands in the Gulf of Nicoya, Costa Rica. 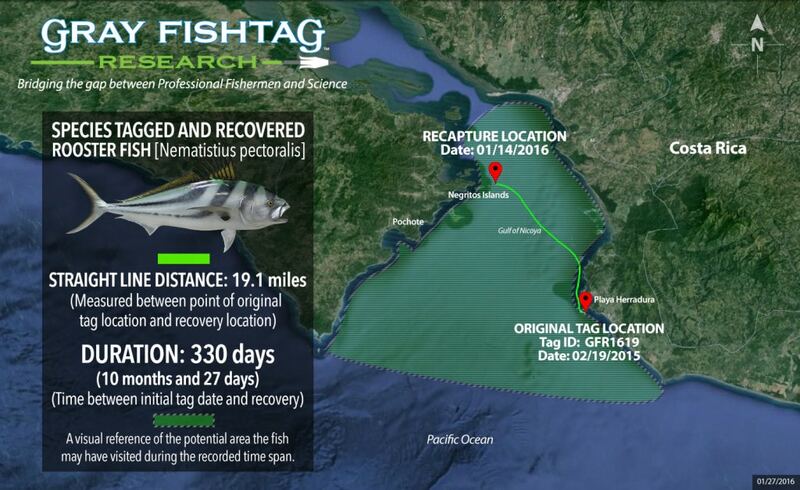 The tag recovery location was approximately 19 miles away from the tag deployment location. During that 330 day time period, the fish most likely travelled along the rocky coastal area within a 40 mile radius of the original tag location. At recapture, the Roosterfish had a total length measurement of 115 cm (45 inches) and weight of 50 pounds. The Negritos Islands is a famous fishing spot that has known to hold a multitude of fish species. That location holds such a diversity of fish due to the unique physical and geographic conditions. There are several underwater rock formations and the water depth changes rapidly from 220 ft to 30 ft which causes some riptides. That area is also where the Gulf of Nicoya water currents meet up with the open ocean. Those conditions are ideal for bait fish and where there is bait fish, there is predator fish feeding. The Sunny One charter boat crew will receive some Gray FishTag gear for their tagging efforts. Captain Thomas Jones will receive a pair of Costa Del Mar sunglasses, a Tag & Recovery Certificate, and Gray FishTag gear for reporting the tag recovery.